Although erosion is a natural process it is accelerated by practices such as land clearing, overgrazing, some cultivations and poorly constructed farm roads and dams. Erosion removes the best, most fertile part of the soil, the topsoil where most of the plant nutrients and soil carbon are found. 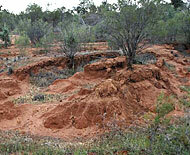 There are ways to mitigate the impact that agriculture has on soil erosion rates. 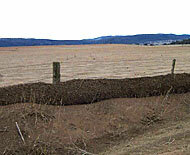 The key to controlling soil erosion by water is maintenance of a protective cover (e.g. living plants, litter, and mulch) on the soil surface. Other soil conservation practices—such as contour banks, filter strips and controlled traffic—are important, but secondary to the maintenance of cover.